A payday loan lender located at 2132 East 71st Street on Chicago's South Side. In black, Latino and low-income communities that have historically faced discrimination when trying to obtain credit from banks and mainstream financial institutions, experts say payday lenders are meeting a demand. But consumer groups counter that the higher-than-average interest rates on the loans put residents who live paycheck to paycheck at further economic risk. 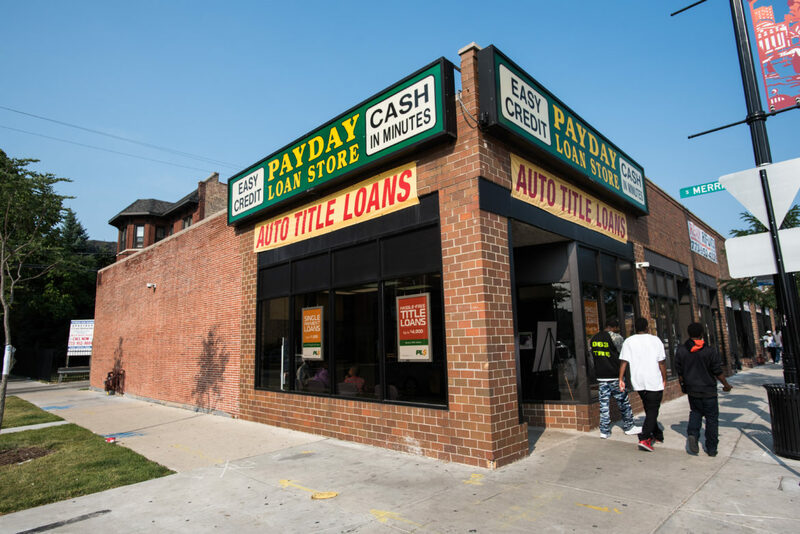 Of the 125 payday lenders in the city, seven in 10 are located where the per capita income within a mile of the businesses is below the city average of about $28,500, according to a Chicago Reporter analysis. Federal regulators are considering stricter rules on the payday loan industry. The rules would do two things Illinois doesn’t require: Lenders would have to underwrite loans and evaluate a borrower’s ability to repay a loan. The small-dollar loan industry thrives on repeat borrowers like Tabitha Scott, of Hyde Park, who is on her third payday loan. Scott fits the description of the disproportionate number of borrowers, according to a report by Pew Charitable Trust: She is young, female, single, African-American and earns less than $40,000 a year. Most borrowers use the loans for recurring, everyday living expenses—not last-second emergencies, research has found. Scott, 35, took out an $800 installment loan from a PLS in South Shore in June after her car was wrecked in an accident. The repairs cost about $1,600. “I needed [the loan] right then, right there,” said Scott, who drives to the Loop five days a week for an overnight shift and makes about $900 every two weeks as a customer service specialist for a bank. So far she’s paid PLS about $900, already $100 more than she borrowed. She still owes hundreds of dollars more in interest and fees. The single black woman has struggled to pay her $500 rent and other bills. Three of the biggest names in the multi-billion dollar business are Americash Loans, Check ‘N Go and PLS. Corporate representatives of the three businesses either declined to be interviewed for this story or did not respond to interview requests. Payday, car title and other short-term loans can saddle Illinois consumers with astronomical financing fees and interest rates as high as 400 percent. A $1,300 loan from Americash with interest, for example, can cost a consumer about $2,600 by the time it is repaid. Dannenbring said the businesses cluster in commercial areas, forming alternative financial services hubs. The downtown area has the highest number, about 15 stationed relatively close to one another, because it draws a high concentration of low-income workers in the food and hospitality industries who commute into downtown to work, experts said. Consumer advocates said Illinois should do more to address auto title loans, which are less regulated and often sold in the same businesses where consumers get payday loans. Auto title lenders target people who own their cars, and interest rates typically can reach between 200 and 300 percent. Borrowers put up the title to their vehicle as collateral, which means it can be repossessed if payments aren’t made. Lynda DeLaforgue, who co-directs Citizen Action Illinois, characterized auto title loans as “even more toxic” than other small-dollar loans. A 2010 Illinois law limited monthly payments to 25 percent of a person’s gross monthly income and required interest-free repayment plans after borrowers have been in debt for more than 180 days. No more than two payday loans or installment loans are allowed at a time. While critics accuse loan agencies like PLS, Americash Loans and Check n’ Go of preying on people’s economic fragility, Kim Zeuli, senior vice president of the Initiative for a Competitive Inner City, a Boston-based think tank, said the businesses are an alternative for people with few options. The core issue, she said, is that people don’t have as many choices as they should have. But Dannenbring said people who have to take out a loan for necessities points to a bigger issue of income inequality. Scott, a customer services specialist, said she is considering asking a friend to buy her groceries and might delay making payments on her car loan and phone bill so she can pay off the loan by mid-September. But if she keeps making the $168 minimum payments, given the interest rate on the loan she will pay $1,700 for her $800 loan. The suit alleges that black and brown communities were targeted with illegal double ticketing, relying heavily on data uncovered by a joint investigation by WBEZ and ProPublica Illinois. Like Ferguson, the city is using public safety systems punitively to raise money in ways that drive poor blacks and Latinos into debt and unemployment. The payday lenders are one of the very few businesses that make loans to the underbanked. Why is that? Either we need to pressure other financial institutions to step up and work with the working poor, or maybe we need to take a closer look at what’s really going on. For all the talk of making a 36% rate cap on these lenders, absolutely nobody is doing the loans at that rate. One could really clean up and steal all their customers, yet not one single bank has ventured to try.